I left the Sunbubble zipped and the Christmas lights and heater on while we flew to see my folks; Richard’s Rube Goldberged auto temp set-up on the lights no longer works, so those would just stay on, but the heater’s would turn it off above 74. I knew the humidity would rise a lot with nobody around to open the greenhouse door by day and I had no idea how hot it would actually get in there. But tropical trees don’t argue with heat, is all I could figure. When we left it that way for five days over Thanksgiving we came home to black spots on the leaves and a graying and withering away of all new growth, taking away all chance of fruiting from what would have been. 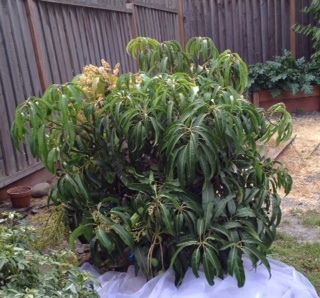 Alphonso mangoes do not like humidity. The fruits from last summer held on, though. I didn’t want another disease attack, now that I know my resistant variety is actually somewhat susceptible, but you do what you have to do, and besides, visiting my Dad was vastly more important. All this in ten days. This is what the new growth looked like as of yesterday that had been just starting in several spots, like the first photo. All those small lower clusters of leaves did not exist yet when we left. 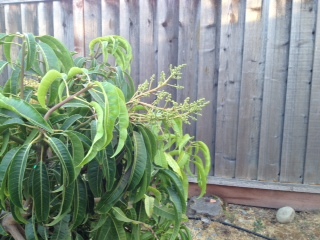 New branches on a mango in flush can grow several inches a day, with the leaves reddish as they grow, then light green, then gradually dark and lush, and I knew that, but still, wow. Heat and increasing sunlight with the season and plain good luck. And suddenly I have a much bigger tree. 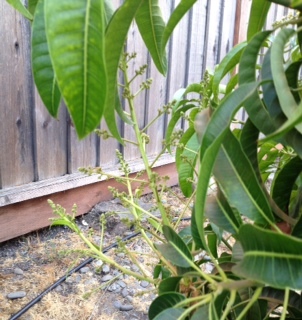 As soon as these bud out and start fruiting, those uprights will start curving gracefully downward with the weight. And what would have fruited in November suddenly doesn’t matter. 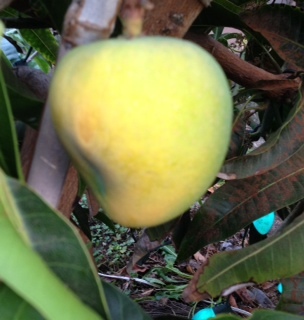 We ate our first just-for-the-two-of-us mango yesterday, the third from the tree. It was like nothing I could describe and do it justice, but it was very very very good. 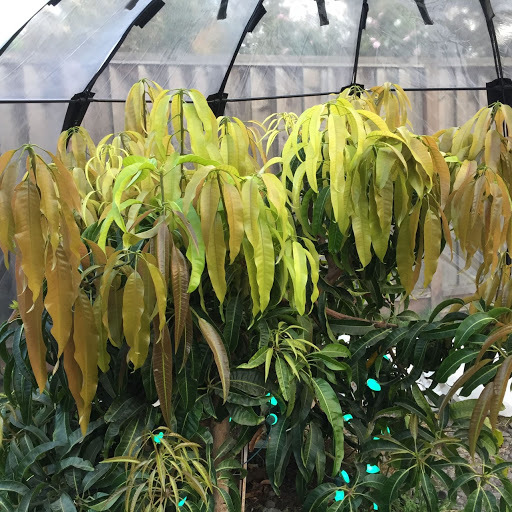 There is one last summer 2018 mango turning slowly yellow as this year makes its promises. I had pushed leaves aside to see how yellow it was and it had fallen into my hand a little early, as that variety apparently does, but it was ripe now. I found a good box for it. I put small-bubble bubble wrap inside, then a paper towel, then nestled the homegrown Alphonso mango there, nicely cushioned for the short trip. Eli’s mom and big sister were outside as I pulled in, along with their neighbor, who seemed to be helping with the daughter’s bicycle. I told them what I’d brought. “It IS? !” His mom and the neighbor both sniffed its fragrance and the neighbor did a little swoon. I explained to her that Eli had helped keep my tree alive while I was traveling when it was small and I’d promised him the second mango ever and this was it. His big sister pedaled her bike in great excitement around my car and towards the front door to go tell him. Church. Then Dani and his beloved and our mutual friend Lee, whose birthday party it was where the conversation happened that led to my tree arriving. I offered the not very large mango to Dani and he inhaled its essence, remembering the Alphonsos of his childhood back yard. I had my good Mel and Kris stoneware set out and we went to it. Mango pieces, homemade chocolate, juice I’d squeezed the night before after the neighbors gave us a boxful from their orange tree. The mango might have been even better with one more day to ripen, but still: I could honestly say, and did, that he’d been right: that that was the best mango I had ever eaten in my life. Such a depth of flavor. The perfume! So much to that tiny bit of fruit the five of us each had. I did not know they could be like that. Wow. 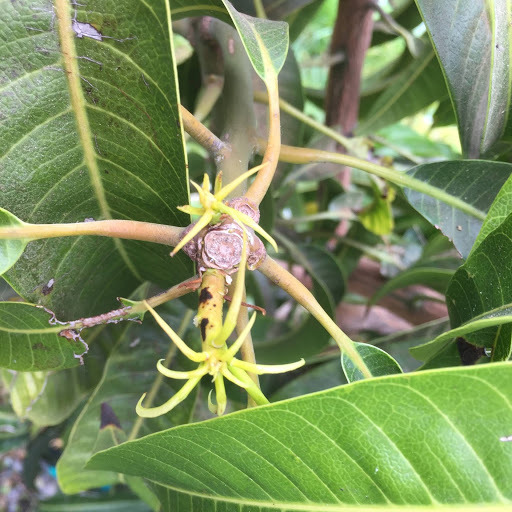 Dani asked for the seed and the skin: the scent of home, and to prove to a fellow ex-pat friend of his that yes you can grow them here–you just have to want to badly enough. His SO teased him that she was sure he was going to grow his own tree from it. They’ve told me their condo doesn’t have enough sun, but hey, if he wanted to badly enough. Right? She’d been spending all her free time of late helping some friends pack up their house. Their moving van arrives tomorrow bright and early, and they were glad they had that one last weekend to finish everything up. Except that yesterday morning the guy’s father, a farmer, dropped dead, utterly unexpected, and they dropped everything and ran for the airport knowing how much his mom would need immediate help. There were still two baby bottles in the sink. Michelle was trying to finish what they no longer could and needed something to package some of their papers that they hadn’t intended for the movers to touch. Sure, I can do that, and I headed off to San Jose with the requested bin. I took one look around when I got there and knew that this was where I needed to be for the next little while. I washed all the dishes, by hand so they would be seen on the drying rack and not forgotten in the dishwasher, I folded the clothes that had been washed, I sorted all the socks of all the sizes. I did not find the key to the firesafe that the toddler had run off with, but we were all in each other’s good company on that one. I remembered the days of one child of mine in particular who was always finding what squeezed into what and the hairpins we shook out of a ride-on toy years ago. The baby blanket! This is the couple I’d knitted a cashmere/cotton 50/50 afghan for, and it was their now-toddler’s favorite blankie. It was there. Michelle called them: I was offering to mail it to them tomorrow if they wanted. (Their stuff was going straight to storage given the new circumstances and it might be months.) Or I could keep it at my house till they were ready, free of moths or loss. Her friend burst into tears: yes please send it?! First thing, honey, first thing. That, at least, is something I can do. Hey, DANI! This is all your fault! Thank you! Wondering if it was ripe yet, I just barely touched it and to my great surprise it fell right off in my hand. My first. Alphonso. Mango. Ever! Already, six hours of being inside the warm house and the fragrance has started to bloom. It was warmer today, in the upper 60s. This afternoon I found this. 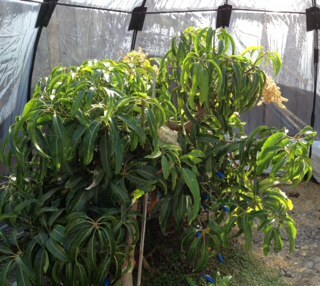 I had wondered when we set up the Sunbubble if there would be water seepage under the sides during a rainstorm that would get to the mango. Nope. It was time to get the hose going inside there again. Turns out that over my birthday it had sprouted new budding branches in five places, which is the best evidence I could have asked for that my new improved heating set-up seems to be what it had needed and means summertime fruit, when it will have real heat to make it sweet. Yay! I also found that my long-time tree guys goofed. I’d hauled my sick self out of bed yesterday morning (thankfully not too early) because months earlier I’d contracted for them to winter-prune some of my fruit trees so that I wouldn’t have to worry about branches falling at my head while doing it myself. Twelve concussions is enough. The pear, which is tall and thin and really isn’t much yet, the big peach (the Indian Free) and the sprawling 25+ year-old Fuji apple. That pear is going to grow a lot in the coming year now that we cut away so much that was shading it when we were making the insurance company happy. I need to set a good foundation for that. Chris called the day before to confirm and I couldn’t stop coughing. Which may well be why when the crew came yesterday the one guy who approached stood well and I mean well back from the door and I couldn’t hear a word he said and didn’t want to breathe on him so I just said you’re here to trim my trees? Apple peach pear? Great, thank you! and left them to it. I was too tired to go look afterwards. Chris always follows up with a walk-through, but I did not hear the doorbell. Not with my stuffed ears. That’s fine, I didn’t want to infect him, either. They’d trimmed the Fuji apple, the Indian Free peach–and the Santa Rosa plum. The three biggest trees, planted in a triangle. Made perfect sense. The pear over yonder needed maybe a dozen snips at most and quite honestly made no sense to call them in for other than as a one minute add-on, while the ten-year-old plum was a project. I know Chris had mapped out what was where for them. If I call and tell them then they’ll have to come back for just such a waste of their time and they really did me quite the favor. I was trying to keep the cost of the job down and figured the plum was mostly at a height I didn’t have to worry about. My lingering achiness is really quite delighted that I don’t have to handle pruning materials for very long at all now. What’s left to do is, thanks to them, a piece of birthday cake. Postscript: I couldn’t find the original email with the contract in it before I wrote this, but I just found the saved document: okay, so Chris did put the plum on the list in August, then. Alright, that makes more sense. Glued to the election returns, glad there will be some checking and balancing–always a good thing. 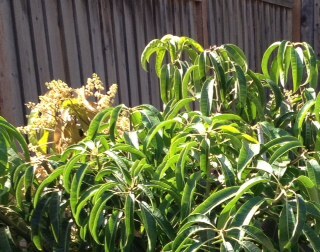 Meantime, the heat is working in the mango tree’s enclosure but, um, not so much in ours. Brrr. Hoping I can reach our HVAC guy in the morning. 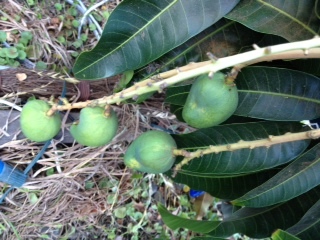 I need to ask: are you supposed to let them ripen on the tree? (Why the traditional store-it-in-camel-dung method? All my camel comes in yarn form only.) 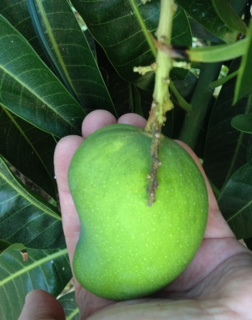 I know pears have to be picked unripe or they’ll go mushy first, and every reference to Alphonso mangoes I’ve found (that would probably be two) said to let them ripen in warm temps, picked. How do you know it’s time to? I love that I finally get to need to ask. They came, they saw, and to my surprise they lifted before I even finished writing an Alice’s Restaurant-style note on the door for any stragglers. It was getting dark but they did it. And then I sent Peter, James, Krys+Sterling, Eric, and Nathaniel off with a chocolate torte each plus one for Bo who really meant to come but was still busy helping a very elderly and quite handicapped woman move out of her home to go to an assisted living facility near her son down south. Bo had definitely earned his torte. After connecting up the wrong rods while it was in a heap on the ground and having to undo and needing Richard to get the side supports but he had to duck way down to get in and only he could reach to screw that top support in… We did it! Well. I’d measured three times before ordering. 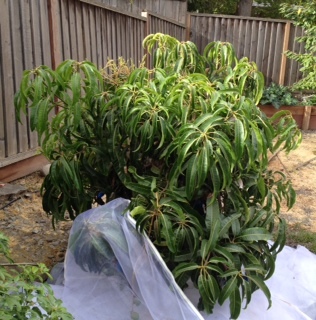 We did want the mango to have room to grow. It’s, um, big. It’s 53 pounds, ergo it has not been hoisted over the tree–yet. I sent up a bat signal. And said to Richard, Can you see that thing with the Cooper’s hawk’s talons? Wouldn’t survive it, he thought. Or the Great Blue heron landing top and center? 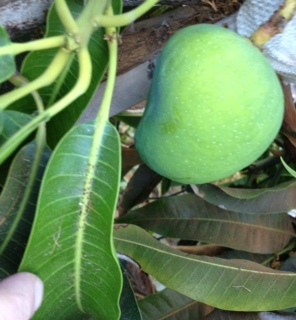 Another mango tree picture, for the sake of the wonderful folks at the county extension service and the UC Master Gardeners who helped me with my question re the Sunbubble and the type of heater. 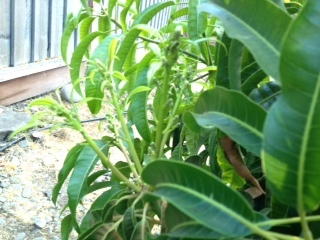 You can see one of the smaller mangoes at the middle, front and bottom. It’s just beginning to set more fruit in those clusters at upper left. How hard is it to find a thing that works. I spent several hours today researching and looking and trying to find a good heater for a small greenhouse. All I could find was cheap Chinese knock-offs that looked like the old tried and true but had dismal, awful reviews. Whatever happened to the ones built to last? To even work? It finally hit me: Sears used to make good tools for the working man. You didn’t want to freeze in that garage with the door open to the world while you worked on that car. And so I tried them, knowing full well their vulture capitalist CEO is trying to kill the company as fast as he can for what he can skim off the top and he’s certainly not putting any money into improving product lines. Lo and behold. One color left: bright red. I can handle that. Stellar reviews. Hey. Happy reviews. One said, I tried all those others but this one actually works and actually keeps working. So it will be my wistful wave good-bye to what once was, both Sears and decent appliance manufacturing standards, and it is on its way. Wish me luck. All by way of saying, I’m going to have to let Eli gently down and tell him that (hopefully) I’m not going to be needing him to cover and uncover the mango tree when I’m out of town anymore: my husband told me he thought I should order that Sunbubble greenhouse and a good heater and not to have to worry about being here at the right time every single morning and night, flu or not. Get the big one, he said. You know it’ll grow into it. I finally let myself feel just how freeing that will be. The tree can just…quietly, on its own…do its own thing. 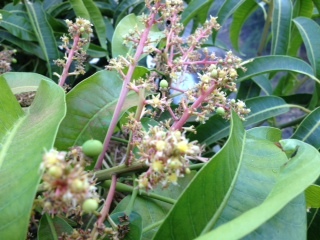 The little sugar ants love the sweet-selling mango blossoms. Individually, they’re kind of their size. It’s a toss-up whether trying to pick them off damages more of the fragile things than they do–but sprinkle some cinnamon on them and they fall right out of the tree. Which has cut down on their numbers, but still, just about every day right now I’m out there taking care of a few more. Get the scouts to keep the hordes from ascending. There were floral clusters in nine places now, the biggest at the top where there’s the most sun, smaller and newer ones below. I checked those out to be sure. And had an impulse, as I walked back in the door, to check my hair to make sure I hadn’t picked one of those up while looking through the branches. Yeah, no, I’ve checked before and there never is–quit being bug-phobic. A few minutes later Richard had no idea what I was shrieking about but he did what I said and instantly went running and came back with a fistful of eye drops. I couldn’t see. There was this left arm over my face and I wasn’t about to move it. Just one? Take the lid off for me? I was desperate. It had fallen out of my hair onto my eyelashes and tumbled straight into… I’d suddenly had an ant walking across my eyeball. When I instantly closed my eye it was literally six feet, under. I promise you next time I will check my hair. Promise. I apparently broke off the head of one of these via the frost covers going on and off, but I think we’ll do okay. 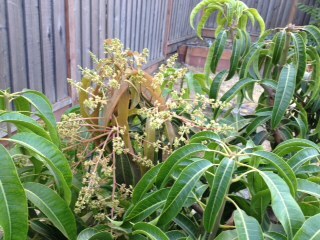 This is the farthest along of the inflorescence, with most of the tiny flowers open. Not yet over here. Nor below. 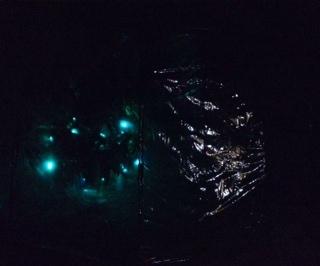 I’m trying to think up a better way to protect the tree from the cold without having to keep its light cut off until the day warms up enough. Obviously, though, it’s survived just fine on my system. With the tenderness of wintertime fruiting, keeping that constant warmth is the biggest thing. 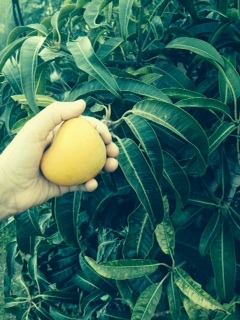 The six–edit, seven mangoes tucked under those leaves (found another one) like these warm days. The tree is clearly, in our climate, not going to be one that produces everything at once and then makes you wait a year for more–it’s more like every branch takes its turn setting up shop. Which is actually pretty perfect if you ask me. Anyway. It just makes me happy, so I thought I’d show a few more pictures. here, in an improbable place, a tree of the tropics celebrates the warmth that comes its way despite the season.